Tomatoes grow fine in my Sacramento backyard. I can usually count on plenty of basil, more zucchini than the neighbors will take, some snow peas, chard and kale, a few small peppers and eggplants and whatever salad greens survive the slugs (in other words, lots of arugula). We have oranges and grapefruit, but I wouldn't even try to grow peaches or apricots. It takes a farmer to grow peaches. It takes a good farmer to grow good peaches. 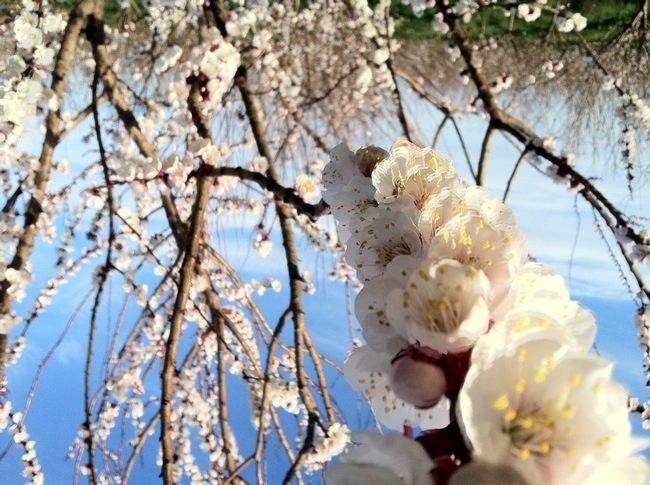 It takes a good farmer and good weather to grow Blenheim apricots. Instead of planting a peach tree, I joined a fruit community supported agriculture (CSA) program, promising to pay $15 a week for a box of fresh fruit every week from June 7 until October 4. By joining I am agreeing to share the risk and the promise of the harvest of a four-acre fruit orchard with four part-time beginning farmers growing fruits and vegetables just west of Davis. Emma Torbet, Sasha Klein, Aubrey White, Marisa Alcorta (Photo: Warren Jones). Emma Torbet and Sasha Klein started growing vegetables as The Cloverleaf at Bridgeway Farms about two years ago. Rich Collins, land-owner and sponsor of The Cloverleaf, planted the fruit trees four years ago but doesn't have the time to manage the orchard, so he leased it to the Cloverleaf farmers this year. Aubrey White and Marisa Alcorta joined as farm partners also this year. 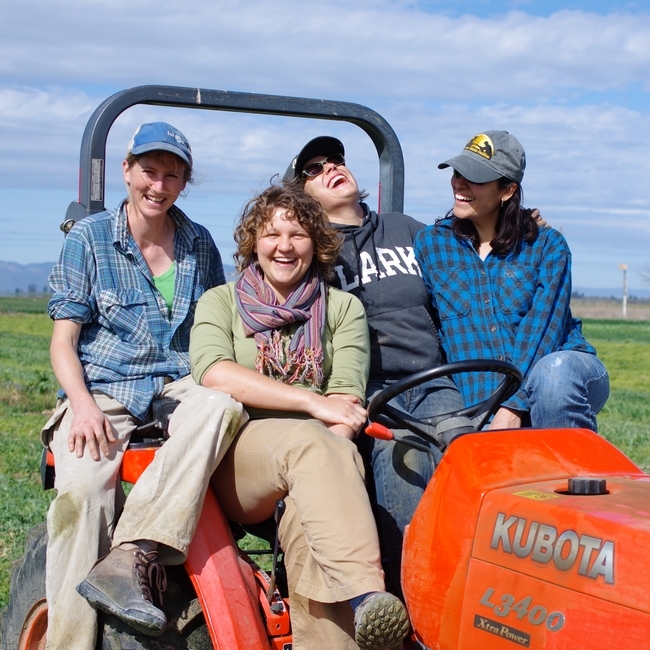 Together, the four women work long hours on weekends and evenings to farm an acre and a half of vegetables and the four acres of peaches, apricots, nectarines and figs. Like most beginning farmers, all four work full-time at other jobs; Torbet at the Russell Ranch Sustainable Agriculture Facility, Klein with the Farmer Veteran Coalition, White with the UC Agricultural Sustainability Institute, and Alcorta with the National Center for Appropriate Technology. The Cloverleaf at Bridgeway Farms offers a chance that is, Aubrey White says, "both attractive and terrifying, with everyone trying to make it happen while keeping their jobs." The monetary investments were low, as they have no buildings or heavy equipment, and Collins offered a very attractive lease arrangement to encourage the new farmers. The vegetable land is certified organic and the orchard land is in transition to organic. The part that is terrifying is the risk of crop failure and poor yields that all farmers face. The Cloverleaf farmers all have some farming experience, but the orchard presented new challenges. White started with the UC Master Gardener Program in Los Angeles, worked with urban farms and community gardens, and for two years at the UC Davis Student Farm. But, she says, taking on the orchard involved a "crazy different learning curve for three out of four of us." Even with all of her agricultural experience, she felt at a disadvantage not having a science background, particularly not having the soil science information to best manage the orchard. Luckily, the new farmers found a mentor. 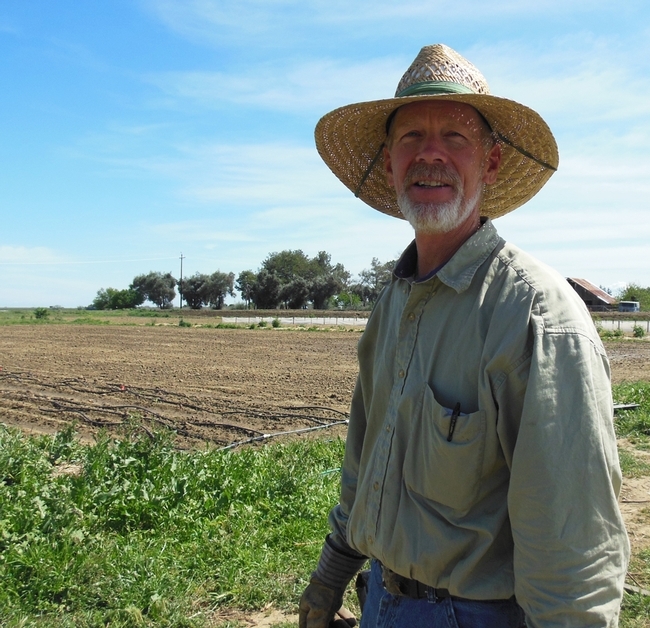 Organic farmer Carl Rosato, owner of Woodleaf Farm near Oroville, is the soil scientist peach farmer that every beginning orchard manager would love to know. Rosato has taken on advising the Cloverleaf farmers as they learn to confront peach leaf curl and blossom rot by keeping the soil healthy and pruning the trees to ensure good air ventilation. Knowing that Rosato is involved gives me hope that we'll see some Blenheim apricots in the CSA box this June. The original point of CSA programs was for the community (eaters) to share the risk of farming with the farmers, and to pay for a season's worth of produce up front to ease the cash-flow burden on the farmer before the harvest. In a pure traditional CSA, the farmer estimates the production for the year and sells shares in that production to as many families as the farm can be expected to feed. Each family receives a box of produce every week, with the full week's harvest divided up among the boxes. Some weeks there would be more variety than others; bounty and low yield would all be shared. Some years there would be good harvests and some years, poor harvests. The farmers are not at the mercy of the market, either wholesale buyers or competitive farmers' markets. Most California CSA operators do not follow this traditional model, but sell to wholesale customers, restaurants, farmers markets and food processors in addition to the CSA customers. This means, in practice, that CSA customers do not share the full risk of the farm production and can expect a more consistent quantity in their box or basket each week. However, CSAs are an important and valuable part of most CSA operators' marketing plan. 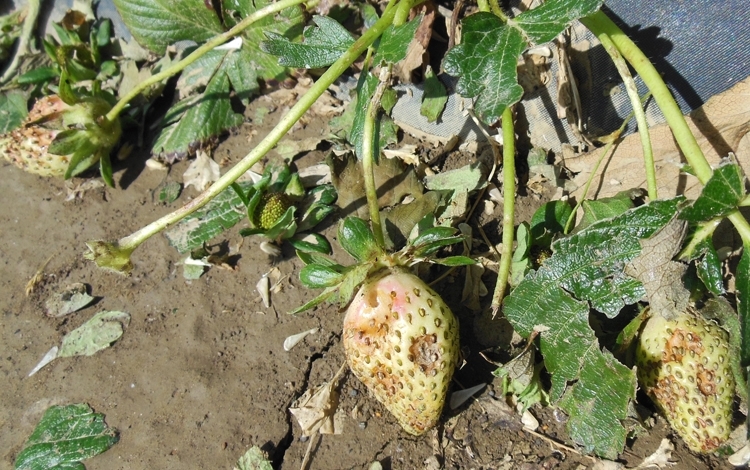 A UC study of several California organic farms selling through different marketing channels showed that the CSAs consistently returned the most profit to the marketing investment. As a small farm with a young orchard, The Cloverleaf's fruit CSA still involves a little risk to the members. If the rain continues through June, as it did last year, we may not get those delicious Blenheims. Last year everyone lost them. But CSA manager White promises to give first priority to the CSA customers, with 25 to 50 percent of the fruit harvest going to CSA members. If needed, Cloverleaf will buy more blackberries from Collins or fill the boxes with the more successful varieties of peaches and nectarines. In addition to the CSA, The Cloverleaf farmers will operate a farm stand, several U-pick days and a harvest festival this year, and sell fruit to several wholesale buyers. Just in case they don't have enough to do, they are considering introducing pastured chickens to the farm next year. The farm stand will open on Memorial Day at the Kidwell Road exit off Highway 80 between Davis and Dixon, and will remain open on Saturdays and Sundays until October. Information about the U-pick days and the harvest festival (and lots of other on-farm activities throughout California) will be listed on the UC Agritourism Directory, www.calagtour.org. There might be a few shares left for the fruit CSA. For more information, visit the website or Facebook page of The Cloverleaf at Bridgeway Farms or email thecloverleaffarm@gmail.com. I'm looking forward to those peaches! Susila Prasab with a bag of beans. 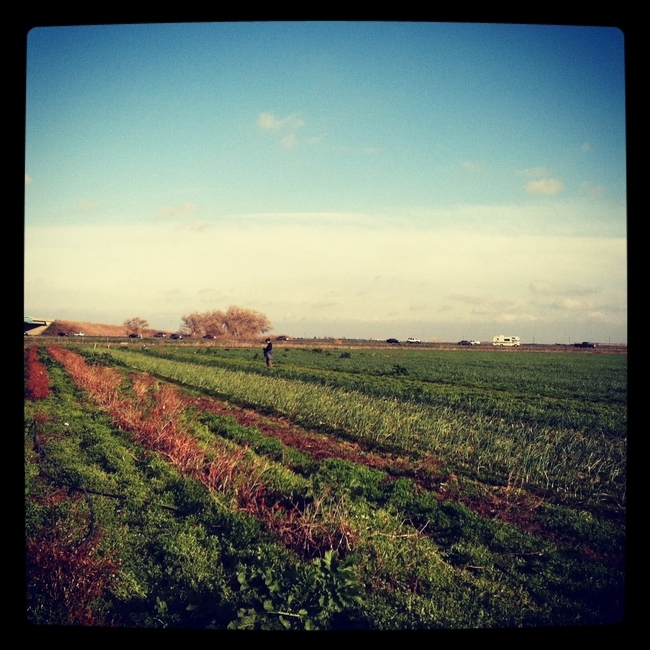 Last Sunday morning, I drove about 10 minutes out of Sacramento to visit one of my favorite farms and pick some peas. (beans actually, but who cares...) R. Kelley Farm, on state Highway 160 just south of Freeport, is an international gathering-place for lovers of fresh black eye peas, crowder peas, other peas, beans and the fresh vegetables that go well with them. Picking your own gives you the best prices, but ready-picked bins of eggplant, tomatoes, melons, peppers and, of course, beans, fill the airy farm stand. When I arrived, the parking lot was full and the place was jumping. 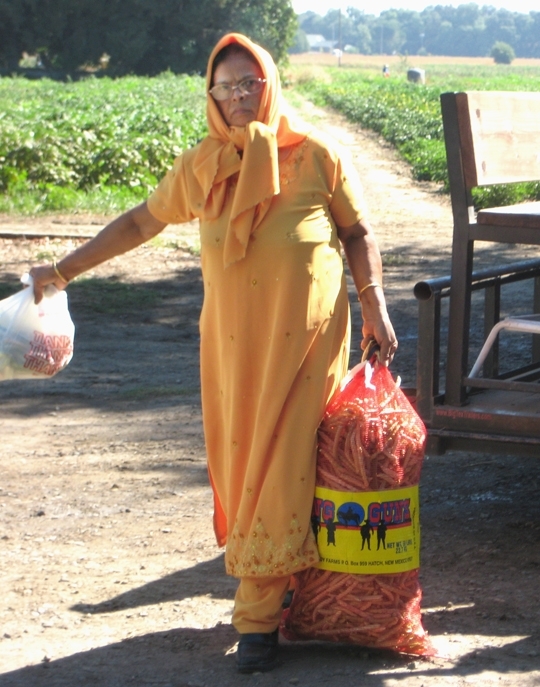 By 11 o'clock in the morning, Susila Prasab and her family had already picked about a hundred pounds of fresh crowder peas. They climbed off the tractor-pulled wagon that brought them back from the picking field with about five big mesh bags full, ready to get them weighed and pay the Kelley Farm 78 cents a pound. The fresh beans (crowder peas, like black eye peas, are really beans) would soon be shelled, cleaned, blanched and frozen, ready to use as the main ingredient for several months' Indian curry meals. Prasab told me the quick version of her curry recipe. Quick Indian curry: Like many recipes, it starts with onion, garlic and chili sautéed in a pan with a little oil. Add curry powder and marsala. Wash the shelled fresh beans and add them to the pot. You can add potato or eggplant or tomato or cilantro, or all of them if you want. Add a little water, cook slowly, and serve with rice. The Prasab family, like most of the others picking fresh black-eye peas, crowder peas and purple beans that morning, were originally from Fiji. 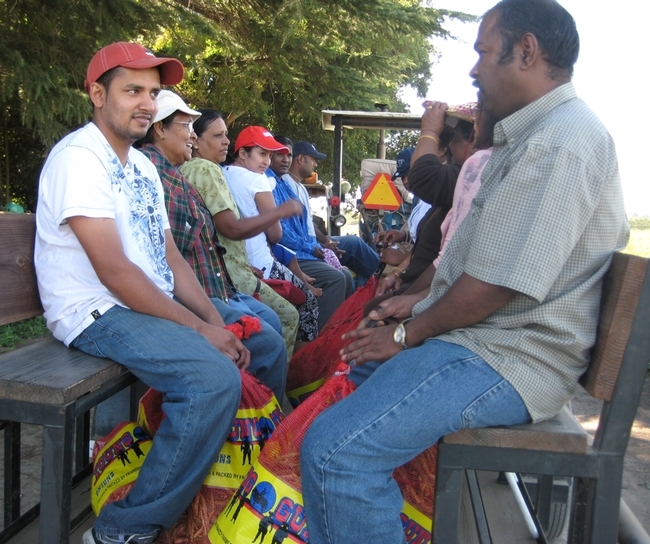 The Fijians came from homes in Sacramento, Elk Grove, and even Hayward to pick at Ron and Ella Kelley's 40-acre farm. 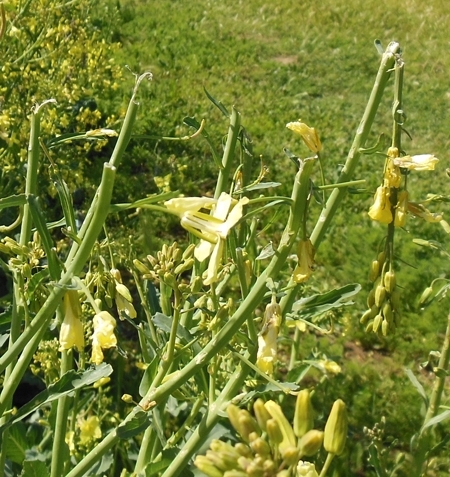 The farm reminds many of them of Fiji, where they often had small farms or backyard plots, growing their own crowder peas and other vegetables. Prepping fresh beans for the freezer: Shell the beans. Boil a lot of water. Throw the beans in for just a few seconds. Take them out quickly and cool them with ice. When they are room temperature, put them in a ziploc bag and seal it tightly. Put bags in the freezer. 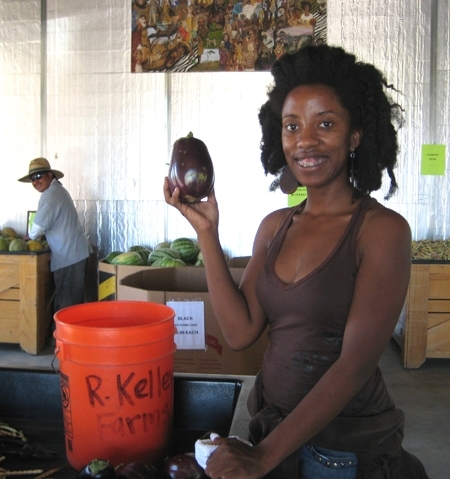 R. Kelley Farms is open for picking or buying ready-picked fresh vegetables Wednesday through Sunday, July through October, from 8 a.m. to 6 p.m. On the day I visited, Lynette Hall, the Kelleys' daughter, was at the cash register. Hall told me she was surprised, at first, to learn that so many people all over the world have recipes for black eye peas, crowder peas, okra, and other ingredients for African-American soul-food specialties. Hall was more familiar with her mother's southern-style beans and offered her own recipes for stuffed zuchini or bell peppers and for Sucatosh. Ella Kelley's fresh beans with turkey: Cook some smoked turkey (necks or legs or whatever you have) until the meat comes off the bone with a fork. Saute onion, garlic and bell pepper. Add the turkey and turkey juice to the mixture. Throw in any kind of fresh shelled beans, black eye, crowder or purple. Cook for about 20 minutes. Serve over rice. Lynette Hall's stuffed zucchini: Cut a big zucchini squash in half. Scrape out the seeds. Saute onions, garlic and bell peppers with some sausage and hamburger meat. Add some uncooked saffron yellow rice and a couple of eggs to bind everything together. Fill the hollowed-out squash halves with the mixture. Top with a layer of mozzarella cheese and some bread crumbs. Bake at 375 to 400 degrees for about 45 minutes. Lynette Hall's succotash: Start with meat in a frying pan. When the meat is tender, add the vegetables, using any combination of onions, garlic, okra, peppers, squash, eggplant, tomatoes, fresh beans and corn. Cut the corn fresh off the cob, cutting the kernels half-way through. Then scrape the corn milk off the cob to get the juice. The corn juice adds to the tomato juice to flavor this dish. Season to taste. Serve over rice. More black eye pea information and recipes. When I paid for my beans at R. Kelley Farm, I picked up a flier on the counter telling me about fresh pears at Maggi's Farm, just next door. So of course I had to stop by Maggi's for some pears on my way home. But that's another story. I have two active young sons. They get plenty of exercise. Their diets, however, can be a challenge. They have different tastes – one could eat breakfast items all day; the other could eat dinner items all day. One likes sugary sweet foods; the other likes salty, fatty foods. My wife is a great cook who makes balanced, nutritious meals, but it’s not easy pleasing everybody. There is one thing we all can agree on: We love fruit. We can eat fruit throughout the day. It might go with breakfast, with lunch, as a snack or mixed in with a salad at dinner. 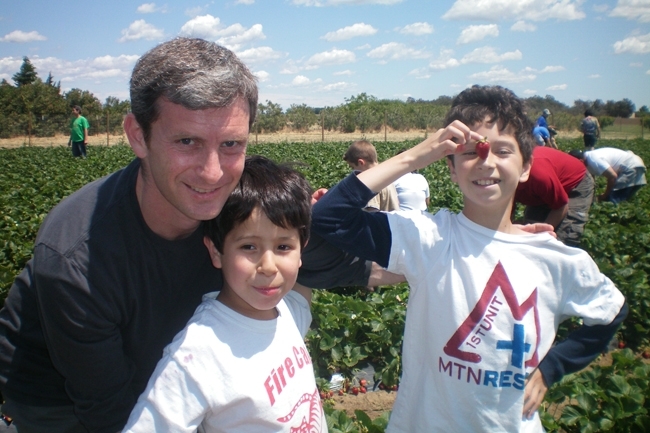 I think my kids like fruit not only because we make it available and encourage them to eat it, but because they have sampled fresh fruit at farmers markets, watched it grow in our backyard and harvested it themselves at U-pick farms. The federal government’s new MyPlate nutrition guidelines emphasize fruits and vegetables – they’re half the plate. But it’s not enough to try to force-feed your children canned carrots. Food can be fun. Giving kids a hands-on experience with fresh fruit can help them appreciate its importance. I’m no dietitian, but as a parent, I offer three tips for helping children to eat more fruits (and vegetables). Go to a farmers market. California has more farmers markets than any other state in the country. Find one near you at www.cafarmersmarkets.com. At a farmers market, the food and the farmers are the stars. You can sample the goods. You can ask a farmer questions. You can learn about the difference between a blood orange and a Cara Cara orange. It’s an event, but a short one. And the price is moderate. Grow your own produce. We’ve had mixed results with this one. Tomatoes came out great one year, were poached by animals another. We have a couple of fruit trees in our yard, but they don’t get much sun and the fruit isn’t sweet. We have had success with herbs, though, and find that our sons will munch on a mint leaf or point out the plants to friends and family. On a recent visit to their aunt and uncle’s house, they picked giant lemons and enjoyed homemade lemonade. No matter how small the effort, it shows children the life cycle of a plant, the anticipation of healthy food and, hopefully, the payoff of plentiful produce for a low cost. 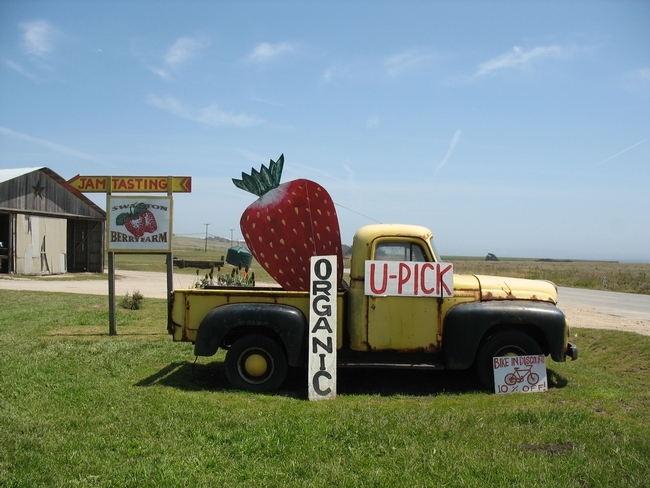 Visit a U-pick farm. 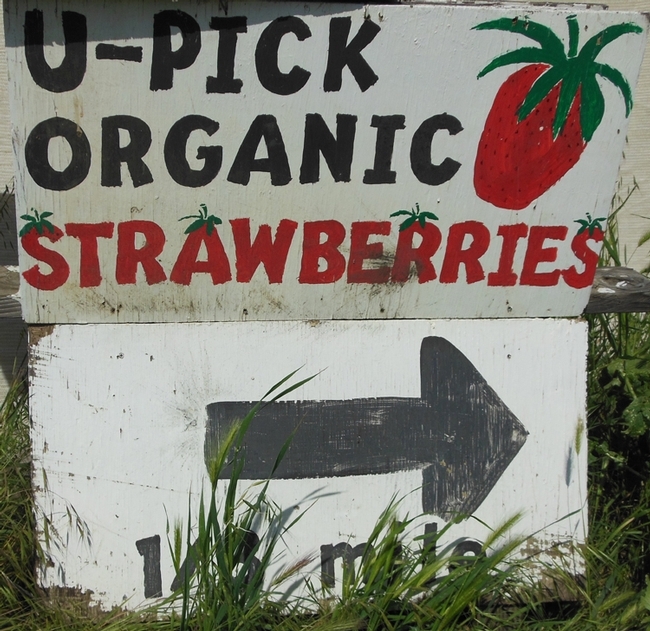 We get an early start to summer by visiting U-pick farms in Brentwood. One son prefers cherries; the other prefers strawberries. Between the two, we have a daylong excursion that provides a weeklong supply of delicious bite-sized fruit for a reasonable price. Brentwood’s cherry season typically lasts from May to June. You can still find peaches, strawberries and other crops there in July. We also went apple picking in September in Sonoma County. 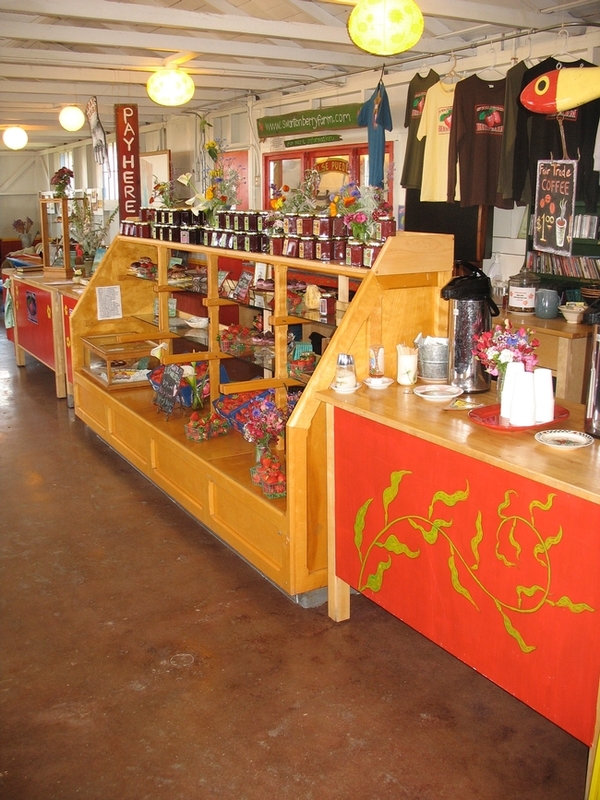 U-picking is part of the broader field of agritourism, which also can include farm stands, tours, fairs and festivals. 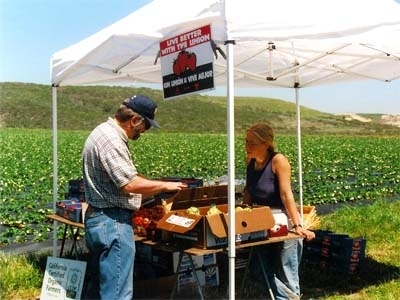 The University of California maintains a statewide agricultural tourism directory at http://calagtour.org. Check it out and may your efforts be fruitful.